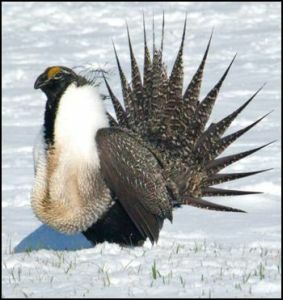 Yesterday, the House Appropriations Committee included Congressman Scott Tipton’s (R-CO) language to prohibit the use of any funds under the Fiscal Year 2015 Interior, Environment and Related Agencies Appropriations Act to be used to list the Gunnison or Greater Sage Grouse as threatened or endangered species. The bill was advanced during a Committee markup yesterday. Tipton said the adoption of the language is designed to postpone the Interior Department’s impulsive march towards listing the Gunnison Sage-Grouse as a threatened or endangered species. Tipton also joined three of his House colleagues on letter requesting similar language for the Greater Sage Grouse. Tipton has been a vocal proponent of state and local species preservation efforts in Congress and recently introduced legislation, the Sage Grouse Protection and Conservation Act, with his Western colleagues, including Representative Cory Gardner (R-CO) to prevent the sage grouse from being listed under the Endangered Species Act (ESA) for 10 years. The bill would instead require states to develop conservation management plans to meet the unique needs of the Sage grouse in each state. Senator Mark Udall and Governor John Hickenlooper have indicated their opposition to the proposal, and Udall has indicated he would like to see the bird listed. This entry was posted in News and tagged Congress, Congressman Scott Tipton, endangered species, Endangered Species Act, Environment and Related Agencies Appropriations Act, Governor John Hickenlooper, greater sage grouse, gunnison, House Appropriations Committee, Interior, Interior Department, local species preservation, Representative Cory Gardner, Sage Grouse Protection and Conservation Act, Senator Mark Udall. Bookmark the permalink.